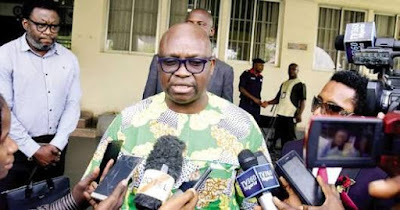 The Economic and Financial Crimes Commission has filed corruption charges against a former governor of Ekiti State, Ayodele Fayose, and his hotel, Spotless Investment Limited. Sources say the EFCC is moving Fayose to Lagos. Fayose is accused of receiving about N1.3bn when he “ought to have known that the said fund formed part of the proceeds of an unlawful activity of Col. Sambo Dasuki (retd. ), the then National Security Adviser (NSA) and thereby committed an offence contrary to Section 18(a) of the Money Laundering (Prohibition) Act..."
The commission said on April 7, 2015, several months later, Fayose personally moved N300m to his fixed deposit account at Zenith Bank with number 9013074033 with the same BVN. Fayose said he didn't force anyone to give money to support his election and that if EFCC wants to investigate campaign funds then it should do so in all political parties.